This was just produced just as the band were increasing in popularity, so it isn't surprising that anything and everything would have been wanted by the fans at the time. This poster has been used and displays some mild creasing, it must have been removed from a billboard from outside of a shop, as it still has multiple layers of various other posters attached behind. These are visible through the plain areas of the poster, but, in a way has actually helped to protect the fragile paper. Apart from the creasing already mentioned, there is just a small tear at the top, and has a small amount of discolouration. This has been stored folded for many years and wouldn't take much for an expert to restore, of to just frame this just the way it is. Really looks fantastic and a must have for any collection. 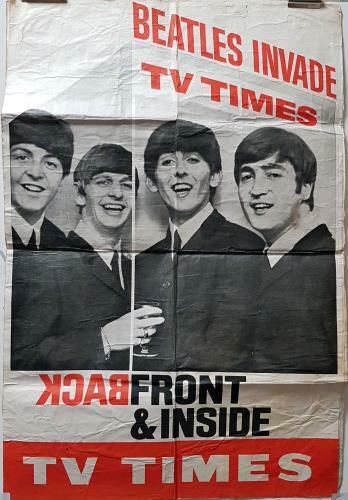 Product Information The Beatles Beatles Invade TV Times UK poster.